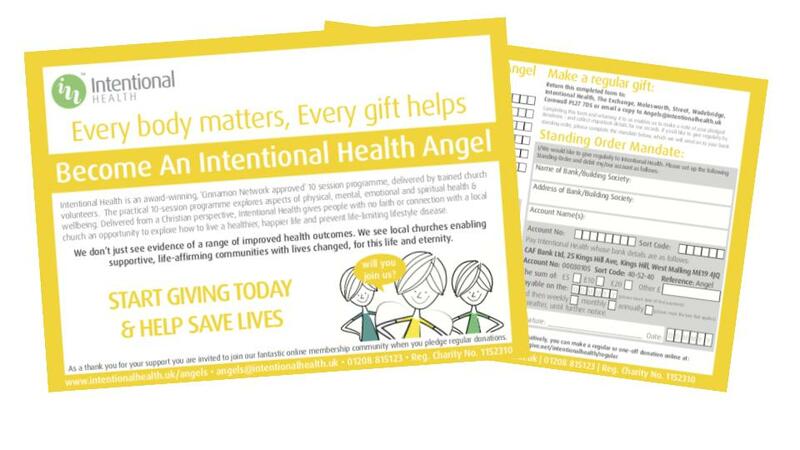 Will you become an Intentional Health Angel today? 3 in 4 people will suffer from preventable lifestyle related diseases that will reduce their quality and quantity of life. We’d love to invite you, along with churches around the nation, to be part of changing this story. Will you join us so we can make a difference? You partner with us by giving regular monthly donations which are wisely invested in equipping volunteers and churches. We all want to know where our money is going when we give and know that it is being used for a worthy cause. Each month we’ll explain how your money is being invested and share a few of the stories of how it is making a difference. We’ll also explore a monthly theme so you can experience the programme content first hand, to help you become more intentional about your own health and wellbeing too. You can benefit from angels community access as a thank you for your regular gifts! Just £5 a month can help save 2 peoples lives. Your donation could mean 2 people find out about how to live a healthy, happy live and avoid life limiting lifestyle diseases, as well as being easily accessible for people who have no faith or connections with a church to hear the Good News of Jesus. Although Intentional Health is for all people of all faiths and none, we are motivated by our own Christian principles. ﻿ Each month we share a short blog post that will inspire you to be more intentional about your own health and wellbeing. If you’d like to donate regularly in the future we’d love to welcome you into our Angels community.